I touched on a similar question last summer. When you have a train of thought, you are actively participating in that process. You are thinking about something, which may trigger another throught and then another, but there is a very logical process of association happening between those thoughts. When you have a thought that drops in completely out of nowhere that doesn’t follow anything you were just thinking or it is in direct response to what you were thinking and addresses you as though it’s coming from someone else, that’s when you know that it’s message. These types of messages often occur when you’re listening, not thinking, or even when you’re not even paying any attention at all. When I have those kinds of thoughts that are sort of injected into my consciousness, I know they’re not me because they aren’t talking in the first person, they’re talking TO me. Those types of communications are few and far between. It’s not something that occurs every day. If I do have an actual conversation with a guide, that tends to come more in the form of an information download. This is a really hard thing to describe, but I’ll try. Have you ever wanted to explain a concept to someone, but you couldn’t think of the right word or words? You knew it, in your head, you just couldn’t verbalize it? That proves to us that our thoughts exist separately from language. As such, thought can be transferred to us in a non-linguistic form. In that sense, it’s more of a “knowing.” That’s what we mean when we say that information comes as a download. It’s an abstract concept with no words attached. This is also what we mean when we talk about information being filtered. Language is inherently limiting, and the minute we attempt to use to to convey a concept, the original concept becomes diluted, like a game of telephone. 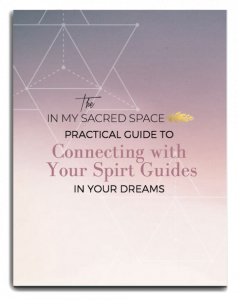 Most likely, though, your guides will use other types of communication that are easier for you to discern – synchronicity and dreams being the two most common.